Finding Amy by Mary Hooper made my day. I first read it when I was 10; I got it from the library next to my school and read it about 5 times before I actually bought my own copy, which I then proceeded to read another 20 times. It was one of my favourite books for a couple of years but then I made the stupid decision to part with it and have wanted to read it again ever since. I'm super happy to have it back in my collection. 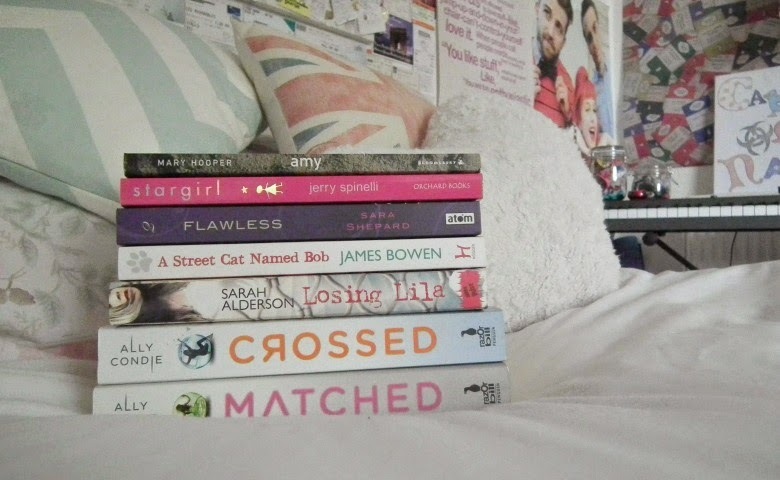 ^_^ I've been hearing about Matched, Crossed and Stargirl for years now and, like always, I'm late to the party but I'm looking forward to finally getting them read. A Street Cat Named Bob is another one I've heard a lot about and I have a feeling I'm going to love it, mainly because of my crazy cat-lady ways. What books have you been buying recently? Have you read any of these? Ooh! Matched- I've heard so much about that. You must let me know if it is worth scavenging for. Aw, that's great that you found that book, Amy. Some really interesting books here. I read Stargirl recently and gave it 4/5 stars. In my eyes it wasn't phenomenal but it's certainly a thought provoking read. Matched has been unread on my shelves for easily a year and sounds brilliant.